"A Violation of Trust" will reportedly air on teevee on 9/11/2012. ... a list which would not be complete without Charlie Sheen, of course. I'm sensing something VERY Capitalistic about this Endeavor with all the "Donate" and "Give $25 to reserve a DVD WHEN it's made."? What? Buchemi must be too busy counting his HBO money to attend this Joke! I for one am DAMN MAD about the poor treatment of the vicsims remains. They are heros and deserved better!!!! This "ex-CIA whistleblower" tells her harrowing self-pitying story about hating self-pity (among other revealing things about "corporate media" and Richard Fuse?). By the way, where is this place? What's with the distorted blurry picture, the Van Gogh-ish painting, the off-camera voices? Is this real? Is she another cyber-puppet, one with a last name that sounds like "Launderer", as in "information launderer"? I am open to the possibility of this being a person in front of a camera, but just reminding us of these questions that come up when we are presented with something ostensibly closer to "truther" truth. Why does her web site look like yet another "raw" and "edgy" torn-paper pile of graffitied trash? Is that supposed to make her story more credible? Why does Richard Gage support her "testimony"? Why does she claim to have received psychic visions that predicted 9/11? That womans function seems obvious. Believable enough to make the Alex Jones fans think they're watching damning evidence, but if they ever try to pitch it to ordinary people they'll just get slapped in the face with "she was in a mental hospital!". No progress made, lots of energy expended. Whether she's "real" or not is immaterial, "she'll" provoke the intended reactions down to a t.
hoi.polloi wrote: Is this real? Is she another cyber-puppet, one with a last name that sounds like "Launderer", as in "information launderer"? I am open to the possibility of this being a person in front of a camera, but just reminding us of these questions that come up when we are presented with something ostensibly closer to "truther" truth. She could be fake (as in computer-generated fake). Her red blouse looks a bit weird. But probably an actor can do. Her story of course is an uninteresting waste of time. Why do we even, as citizens indignant and suspicious of a government, pay attention to a person who accepted in her past to be part and work for a secret agency is beyond me. Yet the fake opposition front keeps cooking these characters with secret service and military background, convinced that they are more credible this way. What a laugh. But I figured the painting, Hoi. Van Gogh does not enter into it. The detail comes from probably the most famous of the "dogs playing poker" series by C. M. Coolidge. I suppose she is supposed to be speaking in a bookshop. Or an auditorium. In any case, weird choice for a background painting. Two of the dogs are cheating. And winning. I don't think that the two paintings are the same [unless prints/reprints had different coloured seats] ie the one in full has a red seat and the [part] one in the picture a green seat. There is always the ploy to consider with espionage and subterfuge in that the Perps can always give credible knowledge to non-credible sources and non-credible knowledge to credible sources. The electric light is lit and poker is a pursuit of the night. So the clock surely reads 01:10 hours, and not 13:10 hours. 1:10 then, but which book? There are 60 or 70 books to choose. Why Romans? Why not Proverbs, perhaps? Or 1 Timothy, maybe? "For whoremongers, for them that defile themselves with mankind, for men-stealers, for liars, for perjured persons, and if there be any other thing that is contrary to sound doctrine"
Can we weave some numerology into this as well? To discredit this forum and seize the gaze of even more fools! 1+10 = <drum roll> = 11 = Twin Towers = I-11-uminati = etcetera..
Wow, you must have been poised at the keyboard waiting to strike, Reichstag. That, or you've had way too much coffee today, though that would only be allowed in the morning, right? Would an electric light be lit if there were no windows in the room? Why have light at all when dogs have excellent night vision? If the clock is broken does it still tell the correct time twice a day? Where you live possibly poker is not allowed to be played during daylight hours hence it cannot be during daylight hours? The dogs might be in Alaska during the winter and passing the time on a lazy afternoon? reichstag fireman wrote: Can we weave some numerology into this as well? To discredit this forum and seize the gaze of even more fools! That was surely some form of humor, yes? Funnily enough - it made me crack up, Reichstag! Very refined! You're right.. leave all jokes to NASA. It's the way they tell 'em. 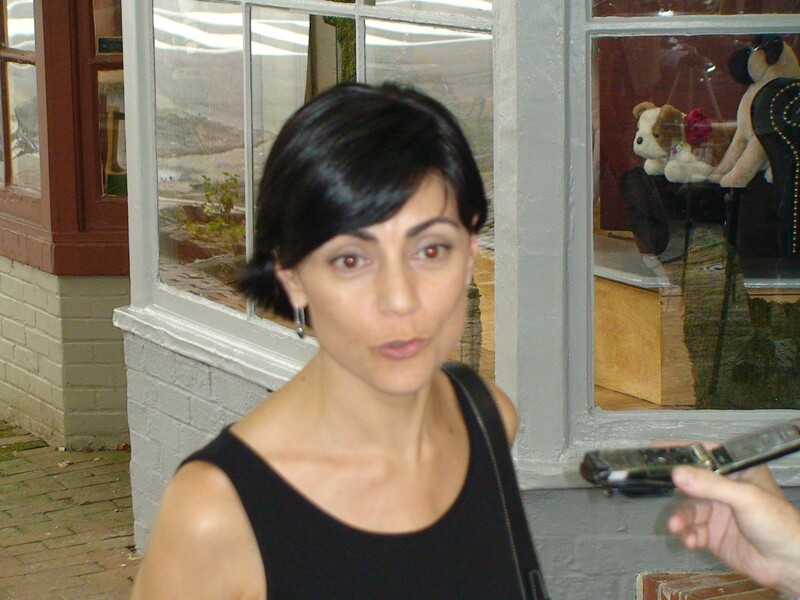 If you zoom in on this latest "whistleblower", she isn't a patch on Sibel Edmonds who even founded a private club for National Security Whistleblowers. A not so great photo of heavenly Sibel... Everything is in focus except for, erm, Sibel..